Roger Waters: The Man Behind the Wall by Dave Thompson is a history of Pink Floyd centered on bass player and song writer Roger Waters. Thompson is no stranger to the music industry. He has written over one hundred books, mostly covering rock and pop music. Most notably his has written on U2, Depeche Mode, Phish, ZZ Top, Bowie, and The Red Hot Chili Peppers. Also included in his work is one of my favorites Dancing Barefoot, a Patti Smith Biography. Thompson is well versed on the topic of Rock and Roll and to his credit he presents an honest view on his subjects and avoids the sensationalism usually associated with Rock and celebrity biographies. 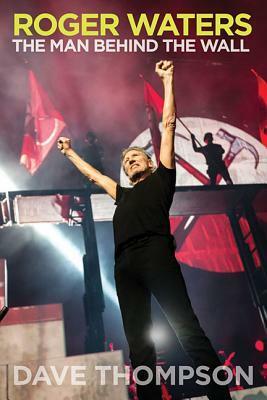 Roger Waters is basically a two part book. The first part is a Waters-centric biography of Pink Floyd starting with The Walland ending with the the band breaking apart after The Final Cut. Rogers is tired of the “Space Rock” tag, guitar solos, extravagant keyboard work, and fans who preferred to get stoned and watch the light show and listen to the music rather than rising to his lyrics. The book then regresses back to his childhood and brings the reader to the beginnings of Pink Floyd. Rogers can’t seem to catch a break musically. He puts togetherThe Wall and with it Pink Floyd releases a single, something they had not done before. “Another Brick in the Wall Part 2” was a commercial success, but the stand out song was not originally intended for the album. David Gilmour’s Comfortably Numb was added for need of an extra song and turned out to be “the king of the castle.” This happens again to Rogers on The Final Cut; Gilmour performs vocals on only a single song (Not Now John) and that turns out to be the most memorable song on the album. The second part starts with the birth of Pink Floyd. It covers the problems and the eccentricities of Syd Barrett and the making of all the Pink Floyd albums. Thompson provides a detailed history and account of the band. This section reverts back to Rogers after covering Barrett. Rogers is certainly a complex person and artist. I took a particular interest in reading about my favorite Pink Floyd album — Animals. Thompson describes the album in a way that I never saw before, and perhaps the explains the reason it remains my favorite Pink Floyd album. The album came out at the beginning of the British punk movement. Animals has the Pigs (war mongers), Dogs (corporate greed), and Sheep (people blindly lead to slaughter). The album was well received by the American punk community and may have had something to do with Johnny Rotten losing his “I Hate Pink Floyd” shirt. A comparison is made of the reception of using the 23rd Psalm in “Sheep” by Pink Floyd and the controversy around Patti Smith using it in “Privilege”… of course, Smith does follow up the Psalm with repeatedly “taking the Lord’s name in vain”. Roger Waters gives a detailed history of Pink Floyd and Roger Waters role in the band as well as touching on Water’s solo ventures (Gilmour’s solo work is practically ignored). This is an excellent book for anyone wanting to learn more about one of the greatest bands in Rock and Roll. There is no muckraking or sensationalism in the book. If anything, the author may have believed David Gilmour’s famous quote. “…Some people think of us as a very drug orientated group. ‘Course we’re not. You can trust us.” All in all an excellent read. 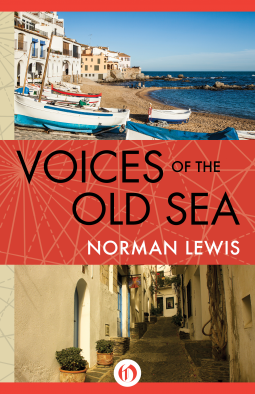 Voices of the Old Sea by Norman Lewis is an account of his time in village of Farol on the Costa Brava in Spain during the 1950s. Lewis is the author of many travel books and was particularly fascinated by primitive cultures in the modern world. He wrote on Indonesia, tribes in India, and the effect of missionary work in Latin America. Lewis spends three summers in Farol and documents his time there. Usually it is fiction that requires you to suspend your disbelief; here it is non-fiction. The reader almost feels like he or she is in a Spanish version of Tortilla Flator Cannery Row. Farol is a town that struggles to make a living by fishing. Superstition abounds in the town. No leather was allowed anywhere the fishing fleet, which in itself is barely functional. Motorized boats have been cannibalized to the point that the few boats that run barely do. The boats are named with pagan references that government officials make the fishermen cover up and rename. Farol is a single commodity town and fishing in itself is at subsistence level. So important is the fishing that locals turn to a magician who can smell out the tuna. Animals are not killed unless there is good reason. A man shooting rats because they might carry the plague is told to stop and told once there is plague then the rats could be killed. Killing them for no reason would not be tolerated, but sending a message is different though. When dolphins are snagged in fishing nets, they are not killed; they are wounded and released to show the other dolphins what would happen to them if they decided to get snagged in the fisher’s nets. Cats have the run of Farol, and it is know as the cat village. Sort is an adjoining town, known as the dog town. Sort is on its own hard times with the decline of the cork industry and relies on subsistence agriculture. The two villages have their own feud. Life is further complicated by Muga who want to bring tourism to the Farol. Villagers fear that the foreigners staring out at the water from the shore would ruin the fishing. Voices of the Old Sea is a fun read. It reads like fiction with nearly unbelievable events and characters so colorful that they seem they could they could only come from the authors imagination. Lewis’ growing attachment to the village and the process of his acceptance makes for an interesting read. A very good book for all. Many of us have a politician or political event that makes us examine our own lives or sets our path. My parents raved over JFK and for my grandmother it was FDR. For me, it was Ronald Reagan. My enchantment with politics didn’t last. By the time I earned my MA in International Relations, I was completely fed up with mainstream American politics. 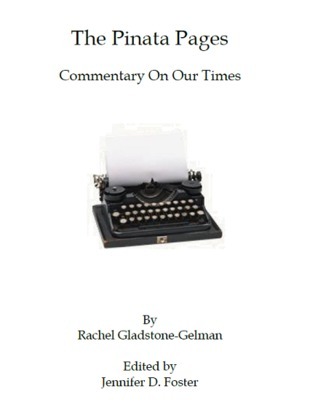 Glastone-Gelman’s moment came with the election of Stephan Harper as Canadian Prime Minister and she deleted her blog. From what I have gathered ,from the few Canadians I have talked to, Harper is an evil super-villain created by right wing American Republicans from the collective DNA of the George W. Bush Administration; I exaggerate, but, well, politics is hyperbole. The Pinata Pages covers a wide range of social issues and at times the hypocrisy that accompanies them. No one likes high taxes but complaining about taxes, and at the same time taking full advantage of all the tax payer funded services is a bit ‘hypocritical. Taking care of our planet is covered: “Fracking is goading Earth to crack and shake more often, and only the ethically challenged would see it as no big deal.” Airport security: Gladstone-Gelman gives America’s own TSA a working over when she compares it to Ben Gurion Airport or even Greyhound. Most importantly, it all seems to be money and how it is used. Many political blogs make their stand with axes and torches slashing and burning not only what stands against their cause but anything in the area. Gladstone-Gelman takes on the issues with a laser. No matter the issue, she addresses in a straight forward manner and genuinely believes in what she is writing. She takes a strong stand and shows no hypocrisy. I couldn’t agree more. Excellent read for both Americans and Canadians. As political commentary, it rates four and a half stars. Memoirs of an Outlaw: Life in the Sandbox by Robert M. Tanner III is a collection of stories about Tanner’s time as a Marine in Delta Company, 2nd Light Armored Reconnaissance Battalion, 2nd Marine Division. The Marine Corps took Tanner to Europe and the Middle East before honorably discharging him. He has since earned his MBA and is now a business systems analyst for the Veteran’s Administration. The thing about Marines is we are great story tellers and we have some of the most amazing real life characters to draw upon. Recently, after almost twenty years, I caught up with a buddy from the Marines I served with. We met up in a local bar and closed the place down still reminiscing about people, places, and events from almost two decades ago. 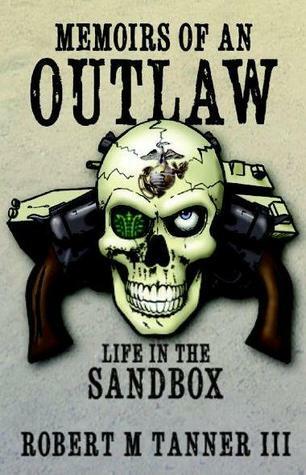 When I was offered a copy of Outlaw, it took me a few minutes to determine that it wasn’t a biker book (outlaw), it was a story about Iraq (Sandbox). I was pleasantly surprised to find out it was written by a fellow Marine, and the book did not disappoint. Tanner volunteered for the Marines and found himself in processing at Parris Island on September 11th, 2001. That event set the tone for his enlistment. He joined under an “open contract”, a euphemism for being assigned as infantry, truck driver, or cook. Tanner got infantry, and his adventure began. As a Marine I will give Tanner credit, no matter what happens, he does not complain, and somehow he seems to have the smoothest deployment in Marine Corps history. Delta Company used LAV-25 (Light Armored Vehicle) armed with 25mm chain gun on a rotating turret, which sit on top of an 8 wheeled platform. It makes a impressive vehicle ; the locals called it the eight wheeled destroyer. It is a crew operated vehicle which carries four infantry scouts, of which Tanner was one. These vehicles are also amphibious which is probably how they ended up in the middle of the desert – there is quite a bit of this type of logic in the Marine Corps. Tanner does something most writers do not do in writing about combat. He concentrates on the Marines and the human equation in the war. What happens outside of the missions is developed more than the missions themselves. The friendship and team building play an important role as well as off-duty activities; simple things, that civilians take for granted, become important to the Marines. Things like the traditional letters, smokes, and any food that does not come out of a pouch or chow hall; to the more modern, like calling home on a satellite phone, the internet, or hooking music up to the LAVs all become important. Fallujah, however, is a very dangerous place and that danger has its cost. The Marines that lost their lives in Iraq are a very important part of the book. Tanner writes an excellent account of his time in Iraq. He does not present the rough, tough, gung ho Marine that is associated with war, nor does he condemn or question the war like Born on the Fourth of July. He delivers a very human and very professional account of his time in the Marines. His writing is clear, familiar and almost seems as if he is sitting across from you telling his stories over a beer. The writing is smooth, flowing, and keeps the readers’ interest. When military terms are used in the book, they are well explained so that someone unfamiliar with the military can easily follow along. Outlaw is highly recommended for anyone interested in Iraq, and more importantly, it is an informal look at today’s Marines doing what they do best. Outstanding book Marine, Semper Fi. Five Stars. 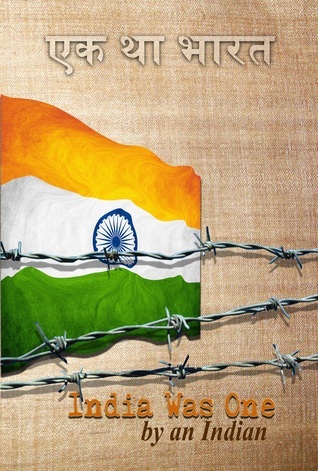 India Was One by An Indian is a novel that is a bit hard to describe. The author who goes by An Indian was born in Mumbai, India and came to America in 1989. He has lived in New York and Los Angeles. I met the author on Goodreads and was offered a copy of the book in return for review. The book is divided into roughly two sections. The first three quarters of the book is is the story of Jai and Kaahi, a young couple who met in college and marry. Jai comes from a well to do family in northern India. Kaahi from southern India. Jai will work at his family’s business interest in Los Angeles. This part of the book is a wonderful story and shares so much information about India, its regions, food, and experiences. It also shares the couples experiences on their initial trip to Los Angeles. The cultural information is great as well as how others see America. There is a particularly long topic of cricket and baseball through out the book. This provides another excellent cross culture examination. There is a melding of Indian traditions in Indian communities in America and the couple experiences in the Indian immigrant/resident alien community. The cultural lessons alone make this book worth reading. The last quarter of the book let me down. My willing suspension of disbelief could not keep up with the events at hand. The author has a great idea, but it could not be believably done in the sixty or so pages of the book. I will leave that as it is and not give away the plot or climax. If you would like to know more about India and its culture, this novel does an excellent job of explaining it as well as giving an immigrant’s view of America. The splitting of India could have been a novel in itself. It needed much more room to develop into a plausible story. Job Loss, much like What’s Wrong with Ordinary takes on real life events and problems and creates meaningful poetry. From the opening poem “Box”, packing your personal belongings under the watchful eye of supervisors before being escorted to the door; to the box that has become home to many people at work –the cubicle, the reader is taken through the pain and the uncertainty of losing one’s job and the process of finding another. Rejection letters, no replies, and finally that job, that isn’t what you want, not what you need, but seemingly the only thing out there. Finally the realization that it is time for a change. 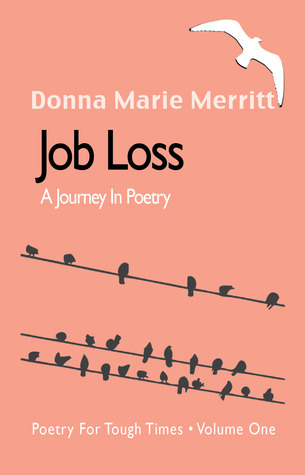 Merritt does an outstanding job capturing the feelings and despair of losing one’s job. Reading Job Loss took me back to when I lost my high paying job in project management and had much the same worries and fears. How could I be out of work with my experience and education. Only 8% of the population have a master’s degree… I should be at the top of the hiring list. I realized that it was time for a change, too. I became a bicycle mechanic. Not, the greatest paying job, but it gave me something I didn’t have before: Time to stay healthy, time to read (and write reviews), and time to enjoy life. Perhaps happiness is not making money but reading and writing poetry. I was instantly taken in with What’s Wrong with Ordinary last year and equally taken in by Job Loss this year. Merritt has a knack for capturing life events with beautiful and meaningful words. Unlike so many poetry collections of modern life, Merritt does not fall into cliches or forced rhymes or trying to make make something into poetry against its will, so to speak. Her writing is different. Rather than describing life in poetry, she is a poet describing life and it shows in her work. I get more than my share of free books to review and rarely need to order a books, but I have ordered her latest book, Her House and look forward to reading it. 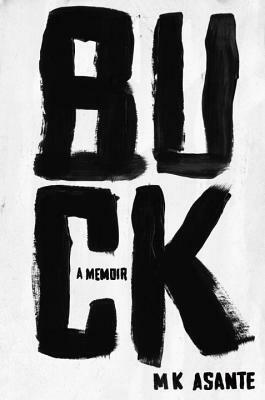 Buck: A Memoir by MK Asante is a young man’s account of growing up in the inner-city. Asante has an impressive educational background including The University of London, Lafayette College, and UCLA School of Theater Film and Television. He has written four books and has been in or directed three movies. He has accumulated many awards including the key to my adopted city of Dallas, Texas. Currently, Asante is an Associate Professor of Creative Writing and Film at Morgan State University. I will be the first to admit that I do not like Hip-Hop. I do not like hearing base thumping from a car a half mile away. * I don’t understand the culture…until I read this book. I grew up on the east side of Cleveland in the l960s and 1970s. I could identify with much of what Asante was experienced. There was the lower class, white not black, the city was extremely segregated and we all kept to our side. There was drugs and violence, too. Cleveland’s education system was, and still is, in ruins. There were kids you didn’t hang around with and places you just didn’t go. And there was music. Previously, I would never had made the connection to what I listened to and what Asante listened to. The sound is different but the message is, surprisingly, much the same. Reading the book, I kept thinking this is the 21st Century version of S.E. Hinton’s The Outsiders or That Was Then, This is Now, except it is all real. Buck (Asante) has a rough life and loses most of those around him. He, like many others, did not see a way out through the established system. Looking outside the systems he sees hope, in criminal activity. However, it is a chain of events that puts his life on a different path; it’s not religion or some miracle, but smart and practical thinking. The book is punctuated with hip-hop lyrics: “At exactly which point do you start to realize that life without knowledge is death in disguise?” K.O.S.. Other lyrics are more graphic and violent, but in them are message of repression, unity, and fighting for your rights. It is what I heard growing up,but to totally different music. Although twenty years his senior, Asante thought me to rethink what I know about hip-hop and its message. I understand it now; Thank you. It is rare to find a book that changes your opinions. Buck is an outstanding memoir of culture, life, death, and redemption. The message is universal no matter what your race. In what most claim to be a fair and free society, many do not experience it. Many are locked into a cycle of poverty; some stay in poverty, some turn to crime, some to drugs , and luckily, a very few escape to remind the rest of us that there are major problems in society that go ignored. — Don’t live in that neighborhood, Don’t live in that school district, don’t even drive through that area…just pretend it does not exist. Asante, made it out and reminds us that we have a long way to go before fair or even a fair chance exists for all. A must read book. *I do now understand there is a difference between rap and hip-hop.